When you are standing on the crush pad at Laughing Stock winery on the Naramata Bench, you can see Glaciers. Or at least how glaciers have altered the landscape of the Okanagan Valley during the last ice age. The Naramata Bench is located in the middle of the Okanagan Valley just north of Penticton on the east side of the Okanagan Lake. The small hamlet of Naramata was once a cottage town where Vancouver people would holiday. While there are still small homesteads scattered up and down the bench, most of the land is now planted with grapes. Currently the Naramata Bench Wineries Association has 25 wineries. Owners of Laughing stock David and Cynthia Enns were at one time financial advisors and the marketing of their wines is entirely based around the stock market. From the ticker tape that shows the closing numbers of the day grapes were harvested, to the Bay Street sign in the vineyard, their previous life is evident throughout the winery. The Enns were in Toronto recently, and I attended a tasting of their ten vintages of their flagship Laughing Stock Portfolio, a Bordeaux blend. Their transition to wine making started in 2001 when David bought a ton of Cabernet grapes from Walla Walla, Washington and made some wine in his garage in White Rock. In 2002, he bought 2 tons of Syrah from Walla. The wine was for personal consumption and gifts to friends. But it was good and the Enns decided to take the plunge, change careers and buy a farm. Their friends thought that if they couldn’t make a go of it in the country that they would be a Laughing Stock. The name was born and in 2003 the farm was bought. That year they crushed eight tons of grapes at a neighboring winery while theirs was being built. They produced only 500 cases in the heat soaked and fire ravaged 2003. In 2004 the volume increased, as did the progress of the winery build. It was not until 2005 that they finally made wine in their own gravity fed winery. The addition of Malbec and Petit Verdot further assisted in their growth and complexity of the wines. 2005, 2006 and 2007 where grouped together in the flight and showed some striking similarities . All the wines where showing the right amount of age and by the time the 07 was tasted I was fully understanding David’s approach to winemaking. The next flight 08, 09 and 2010 had a different feel to them. They all had fruit from a vineyard they purchased in Osoyoos. Osoyoos is a small town that is located right on the boarder of the United States. Much of the soils there are sandy and temperatures often reach in the 40s in the summer. It is classified as Canada’s only desert and it is not an uncommon sound to hear rattle snakes in the vineyards. The vineyard the Enns purchased in 2007 is 22 acres and is just over a kilometer from the boarder on the east side of the Osoyoos Lake. This gives the vineyard many hours of sunlight during the day, often over 12 in the summer. In this group of three wines, the one thing that very different was the amount of Cabernet in 2010. Portfolio is a Merlot dominated blend, but in 2010 David thought that it the Cabernet was so good he wanted to make it the star of the blend. With 42%, 32% Merlot, 18% Malbec, 6% Cabernet Franc and 2% Petit verdot, the wine was certainly a stand out in the flight. It was divisive at the table, at which sat a mix of wine writers and sommeliers. Some people liked it, while other thought it was a sidestep from what is normal. Finally the last two wines where the most currently released, the 2011 and 2012. The addition of the Osoyoos fruit is welcomed and the trajection of the wines is exciting. The earlier wines of 05-07 showed great purity of fruit and, now that they are close to the decade mark, are drinking nicely. Once the later vintages age and are fully ready for drinking, there is no doubt that these wines will be among the best in the valley. It is always nice to taste older, new world wines. Especially from a winery that is so undervalued and under represented in Ontario. It’s also a treat and steep learning curve sitting at the table with a winemaker and discussing some of their wines. When you get to taste 10 in a row it is truly a revealing look at one wine and its maker. 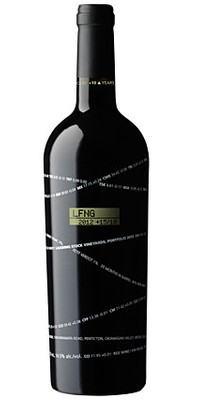 Laughing Stock’s second red wine, ‘Blind Trust’ is available in its 2012 vintage through the LCBO Vintages program. Click here to find a store stocking it near you. People often think that being a sommelier consists of drinking wine all day and then talking to guests of the restaurant all night. Sure, there is some truth in that. I am lucky enough to taste a great deal of wine, but I also have to do a lot of research about the wine independently. In this day and age, I am thankful for the internet as a resource tool. Most wineries have a website, making it easy to learn more about what is in the bottle. However, many of these wine sites are consumer-focussed and/or purely marketing and lack any sort of the technical detail I require as a professional sommelier. There are waiters to train, other sommeliers to discuss with and most importantly, paying guests that ask questions. When it is 9pm on a Friday I need to know whether or not that Riesling is sweet or just how juicy that Shiraz really is. Is there enough acidity to stand up to the braised lamb shoulder? If I want to completely geek out about a wine and learn about the clones of each variety and what vineyard they are grown in, I should be able to find that out with a click of the mouse. Wineries are kidding themselves if they think flashy web sites are all people are interested in. There is a laundry list of things that are helpful for any sommelier or serious wine drinker; the more information there is available the better off we all will be. We are, obviously, trying to enjoy and share wine. In this day and age of corporate transparency, it seems to make sense that wineries would want to lay out as much information as possible. Dates the harvest happened, and if you have been making wine for more than 5 years, please have technical details about previous vintages. If you regularly taste back vintages (as I assume you should), please have notes about what stage the wine is at and how they are progressing. Maps are fantastic. No matter how small you are at least have some sort of an aerial view of your vineyard. If you have own or purchase from different vineyards in your area show maps of them and talk a little about who grows the grapes. Site matters. The grower is as important as the winemaker and should be recognized too. Tell us about winemaking practices: sustainable/organic/biodynamic. Short videos are the way forward. If a winery can make a video that is short enough for the viewer to watch quickly, with the winemaker talking about the vintage, the wine, the winemaking techniques, it would be a bonus. At the very least, please have a PDF tech sheet for each wine. There are people that print and file such things and use them as training tools. I often say that the being a sommelier is like being the midwife of the winemaker. We are making sure that the wine is in the most ideal condition possible when first poured into a glass for a guest. Of course there are many other details that may or not be needed, but from where I drink I crave these details. And wineries that are serious and proud about their wines and where they came from should also be interested in such details, and getting the word out to the world. In my opnion, the best winery website (with interactive maps, detailed tech sheets and a short video of the winemaker talking about each wine) isRidge. One of the most comprehensive BC winery websites is Orofino Vineyards. For all the dreamers out there, one of the best Bordeaux websites is Mouton. There is lots of info here plus great stories about each artist. Most champagne houses rely on flash and music to try and get their point across. However Pierre Gimonnet & Fils is one that has fantastic information and is easy to access. Antinori provides detailed maps and information on all their wines. Great info here on biodynamics and loads of info about the appellation and wine on the Coulée de Serrant site. Good effort by Brewer-Clifton winery to make a short video about each wine. Kistler Vineyards shows that it’s all about the soil in the vineyard here. The iconic and ironic Bonny Doon Vineyards gives us a fantastic video about the virtues of the screwcap. met the police the first night I was in France. Well I saw them, in the lobby of the hotel I was staying at. Arresting three men. I arrived in Reims, to tour the vineyards of Champagne and was tired from a long day of travel. Not only was I carrying my backpack, but also two bags under my eyes, as I searched the town for a place to sleep. The sun was going down, I was in a strange town where I knew no one, and no one knew where I was. And what’s more, I hardly knew the language. Armed with what I could remember of my high school French, I managed to find a room in the main district of town. I went upstairs to check out the room, and upon my return to the lobby, I was greeted with two police officers apprehending the three men in the lobby. Between yelling at the men and the police, the clerk managed to check me in. Only after seeing the hesitation on my face did he throw in a free breakfast. Welcome to France I thought; try the Champagne. And that was what I had come to do. Not just the Champagne, but as many wines as I could. I wanted to bike through the world’s greatest vineyards, eat the grapes, try the wine, and expand on my French. So from London I found a cheap flight to Reims, and thought that I would start my oeno-trip, as an aperitif, in the region of Champagne. With a population of just under 200,000 Reims is only an hour flight from London and at 145 kilometres from Paris, is just over an hour on the train. It is home to many of the major Champagne houses, including Krug, Louis Roederer, Piper Heidsieck, Pommery, as well as Veuve Clicquot Ponsardin – all of which offer tours and tasting at a nominal fee, although many are by appointment only. Most are closed between noon and 2 p.m. for lunch, so it is best to call ahead. Otherwise you will end up like me, lost, in the pouring rain, wondering why these people take so long to have lunch. The receptionist at Piper was kind enough to let me wait in the lobby, as I was completely soaked, and a little chilly. Such was the beginning of my first tour of a French winery. Welcome to France, I thought. The next day I boarded a train to Epernay, the other main town of Champagne. It is less than 35 km from Reims, through the lush vineyards growing the three grapes used in champagne: Chardonnay, Pinot Noir, and the lesser known Pinot Meunier. Just as in Reims, there are many famous Champagne houses in Eperany, most of which are found on Avenue du Champagne. Located side-by-side are Moet & Chandon, Perrier-Jouet, de Vouge, Pol Roger and Demoiselle. Across the street from Moet et Chandon, is a classic French garden and guest house that was built for Napoleon, who frequently came to visit. Owned by Moet et Chandon, it is still in use, but only for private functions. The most impressive of all is de Castellane. With its huge, cathedral-like bell tower over looking the town it is worth the walk from Avenue du Champagne. Again, all have tastings and tours, with Moet et Chandon being the most popular and most informative. Look for the large statue of the Benedictine monk, Dom Perignon, just outside the main doors. The remains of Dom Perignon can be found in the abbey where he lived, in a small town called Hautvillers, a short bike ride from Epernay. Epernay is the best place to rent a bike and get out into the vineyards and see the grapes in action. There is a wonderful bakery in Epernay, just off the main square, that has some of the most mouth-watering breads, cheeses and meats in town. Hop on a bike and eat in the vineyards of your favourite champagnes, all of which are conveniently marked at the road in front of the vines. Veuve Clicquot there, Moet et Chandon here, Louis Rodier around the corner. For me it was like I was having lunch with my favourite celebrity, except I could not ask any questions; just sit and admire. And once in a while, have a grape or two. Welcome to France I thought.